You may be familiar with Auto Glass Week, in which case you seriously enjoy following the automotive glass industry, but if not…it’s kind of a BIG DEAL!! Auto Glass Week is a global event in which companies from 19 countries gather to learn and demonstrate the latest and greatest safety standards and technological innovations happening in the world of auto glass. Starting on September 27th 2018, we plan to compete in the Pilkington Clear Advantage Auto Glass Technician Olympics competition (AGTO) for the title of the NATION’S BEST AUTO GLASS TECHNICIAN!!! 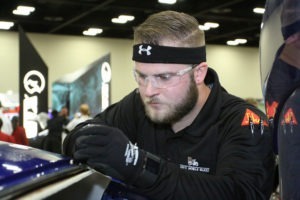 Collin Walton, Certified Don’s Mobile Glass Auto Glass Technician out of the Merced Store, will be tested in every way possible during an arduous 2-day competition. 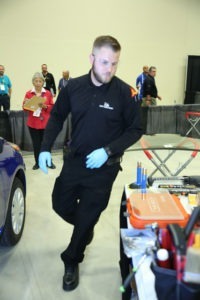 The AGTO is intense and Collin will be required to flawlessly execute windshield and back glass removal and replacement, demonstrate in-depth industry knowledge including the latest safety standards, communicate throughout the entire process using exceptional customer rapport, and do it all in a timed setting. But, Collin is no stranger to the Auto Technician Olympics. In 2016, our very own Collin Walton placed FOURTH in the country!! This year, we know he will bring home the win!! To check his progress, follow us on Twitter @Don_Sez and @autoglassweek #GoCollin!